Rev. Eugene E. Munn, Sr.
Rev. 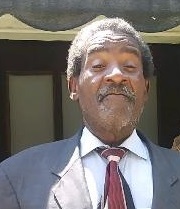 Eugene E. Munn, Sr. age 72 of 5540 Deep Hollow Court Fayetteville NC departed this life on February 11, 2019. Funeral Services will be held on Monday, February 18th at 12:00 Noon in the Wiseman Mortuary Chapel. Burial: Sandhills State Veterans Cemetery, Ft. Bragg, NC. He is survived by: wife, Patricia; sons, Derrick Jenkins, Eugene Munn, Jr (Serina), Christopher Munn (Tiffany), Joseph Munn, Raymond Munn and Peter Munn; daughters, Lisa Jenkins-Miller (Corey), Eugenia Jenkins, Cheryl Munn, Donielle Munn and Aqila Munn; brother, David C. Munn Jr. (Margaret); sisters, Maggie Munn-Jackson (Fred) and Sarah Munn-Herring (Ronnie); fourteen grandchildren; six great grandchildren and a host of other relatives and friends. There will be a viewing on Monday from 9:00 AM to 11:00 AM at the funeral home; the family will receive friends at the home.